The majority of the history books on Indonesia are surveys covering all of Indonesian history, from the early prehistory to the recent present. Often they cover the whole of South-East Asia and the Indonesian radical movement is covered only as a small part of the larger nationalist movement in Asia. Often Indonesian radicalism is related more to the international anti-colonial movement than to Indonesian society specifically, and the danger of this is that Indonesian radicalism is tied too closely to its European origins. Although it cannot be denied that Indonesian nationalism, socialism, or communism, with all their historical, political, economic, and social elements, originated in Europe and were unknown to Indonesia until the beginning of this century, one has to be careful to use a terminology that may well fit into the European scene, but which may not at all, or only partially, cover situation and conditions in Indonesian society. Historians have far too often tried to explain the independence movements in Asia as if it were Europe during the nineteenth century, and they have not sufficiently taken into consideration the peculiar characteristics of the traditional societies of the various geographic areas. There also has been an obsession with pairs of opposites which are by definition irreconcilable and as a result it has been assumed far too often that such opposites would automatically exist in Indonesia as well.1 The struggle within the Sarekat Islam or the Partai Kommunis Indonesia, for example, are analysed in terms of radical socialism versus bourgeois nationalism, versus aristocratic traditionalism and conservatism. That group differences played a role in Indonesia is, of course, true, but one has to be very careful with transplanting European class antagonisms into the Indonesian scene. Although a small, mainly Javanese, élite thought and wrote, using terms borrowed from Western ideologies, this does not mean that such ideologies had, therefore, any great affect on a society which was far often much most easily aroused by an appeal to its traditional heroes and Islamic faith. It is the aim of this paper to analyse political activism in Indonesia between 1908 and 1928 against the background of the Indonesian, and specially the Javanese, traditional society, which at that time was undergoing the onslaught of Western capitalism. I will try to show that an analysis of the Indonesian political movement in terms of nationalism or socialism must take into consideration what these terms meant in their particular Indonesian setting. I have chosen the dates 1908 and 1928 because they represent the beginning and end of the first phase of Indonesian nationalism. Before 1903 Indonesian resistance against the Dutch Colonial Government took the character of traditional uprisings. In 1908, the first nationalist organisation, the Buti Utomo was founded. After 1928, the founding of the Partai Nationalis Indonesia, after the destruction of the Partai Kommunis Indonesia, heralded a period of more purely nationalist movements, which sought to find in the traditions of the Indonesian people the foundations of their organisations. Between 1908 and 1928 a transition took place from tribal revolt to an independence movement based on the values of the larger Indonesian society. Political activism in Indonesia during this period, as in other Asian nations, was triggered first by the defeat of Russia by Japan, and then strengthened by the events of World War I.2 This was also a period during which economic shifts, urbanisation, changes in status, the reawakening of Islam as a pre-nationalist unifying ideology, and the development of an incipient labour force took place. 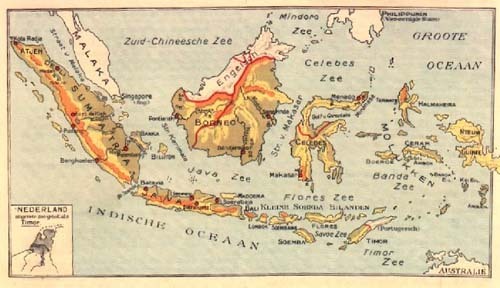 With a more Western orientation in the education of the Javanese aristocracy, these were all contributions to the development of active Indonesian nationalism.3 Finally, it was the period during which the Dutch Colonial Government introduced the so-called "Etische Politiek" (Ethical Policy), which was perhaps the greatest single impetus for the development of Indonesian radicalism between 1908 and 1928. 1. Cora Du Bois. Social Forces in Southeast Asia, p. 32. Du Bois claims that the Dutch Colonial Government had not been able to destroy the credibility of the Javanese nobility, which continued to play an important role in Indonesia, even after independence. 2. Dr. H. Bouwman. Enige beschouwingen over de ontwikkeling van het Indonesisch Nationalisme op Sumatra's Westkust. (Some observations about the development of Indonesian Nationalism on Sumatra's West Coast), p. 7. Dr. Bouwman gives some examples of influence of such as the defeat of Russia by Japan, and the outbreak of World War One, on the population of Sumatra. 3. W.F. Wertheim. Indonesian Society in Transition, p. 313.